You can see all kinds of pictures of these activities in action from my past poetry posts HERE. Enter to win it by commenting below with your favorite literary device to teach to students! The winner will be announced tomorrow. If you don't win, you can grab it for 30% off (that's only $3.49!!!) 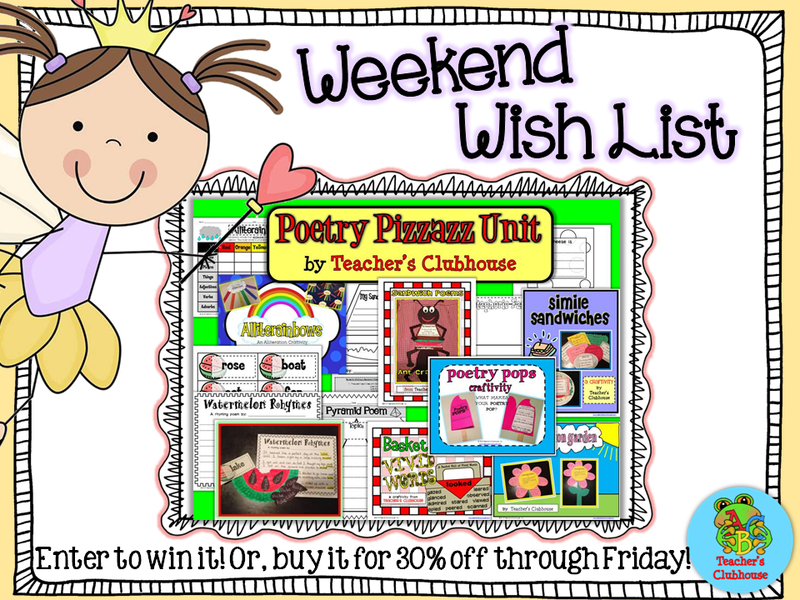 in our TpT shop through Sunday! I love teaching my students poetry!! It allows for such creativity, imagination and emotion to shine through!! I would love to win this package!! I love teaching onomonopeoia to my kiddos. It so fun to incorporate comic strips and see the adorable things they come up with! This is GREAT! I love all the visual crafts that go with them as well. They would make get the students motivate to work on these, as well as make great displays. I love this idea. Thank you! I love teaching the kids idioms. They enjoy all of the 'silly' expressions! I love to teach metaphors! My second graders love poetry! This package looks awesome! I love teaching similes and metaphors. I have my students analyze some of their favorite song lyrics to find the similes and metaphors. It opens their eyes to a whole new world. Often they come to school and tell me about how they heard a metaphor in a song after I teach them about metaphors. I love to teach poetry. It allows kids to be creative. I would love to win this unit. I love reading poetry to my students but would always like more resources when teaching poetry. This would be a great help! We had a blast with similes this past year! This is great! I would love to win this! I love teaching idioms. I have one written on the board every morning. I love to watch their initial responses as they read them. We then ponder their meaning throughout the day. I love using poetry and nursery rhymes. I can use these as a spring board for all our strategies and they seem to absorb so much more from them. I love teaching onomatopoeia through poetry. The kids use it in their own poetry and then apply it to their daily writing to add detail and character to their stories. I love teaching onomatopoeia and showing old Batman and Robin clips. Thanks for the opportunity to win! I have more than one favorite!! The kids love idioms and onomatopoeia! I really enjoy teaching poetry!! This will be my first year teaching reading...I'm moving from Math/Science to ELAR/SS!! Love the poetry unit!! Fingers Crossed!!! I would love this and so would my kids!!! My 2nd graders seem to love alliteration best. I love to try to encourage free verse so their creativity has no rules. I love teaching idioms to my students. It's a hard concept sometimes, but once they get it they love using and finding them. In my first grade class we love to learn about mental images. We use poetry and stories to practice this important skill! We use poetry for rhyming, punctuation, grammar, parts of speech and more! This looks awesome! Poems teach rhythm and rhyme, we use them all the time! Apparently it is no accident that amazing alliteration is my all-time acclaimed appliance as we amble our way through second grade. Smiles! I love to teach hyperboles and personification. I love to teach all types of figurative language! I love figurative language, especially idioms, as well! I love teaching alliteration. It is so fun to get tongue tied! I love teaching and expanding vocbulary by teaching vivid words. Thanks for a chance to win! !